Can Boston Rugby Club repeat upset? Boston Rugby Club are hoping they can upset league leaders Melton Mowbray once again. Willem Jonker’s side travel to face the Midlands 3 East (North)’s top side on Saturday (KO 3pm). In the reverse fixture, the Blue and Whites - currently in sixth - held Melton to a 10-10 draw at the Boardsides - the only side to take points from the highflyers so far this season. Saturday’s scheduled match against basement side Mellish was postponed late on Thursday evening. 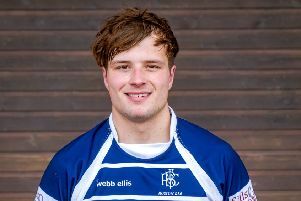 This left the Blue and Whites with no First XV fixture. The Mellish contest is to be re-arranged, a date not yet confirmed.